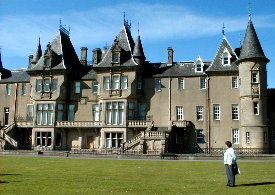 Renting a car in Edinburgh, our trusty travelers set out for the town of Falkirk, the location of CALLENDAR HOUSE said to be the ancestral home of Esther's family. As the story goes, somewhere around the early 1300's (and weren't they all) the family Callendar supported William Wallace and when he got beheaded, they got evicted. Although the current occupants did not seem real willing to pay the back rent for some 600 years, they have kept the place in good repair. 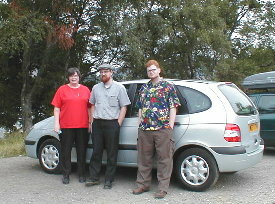 Here the three old friends prepare to set out in a shrunken version of our 2000 Dodge Caravan. Actually, quite roomy. 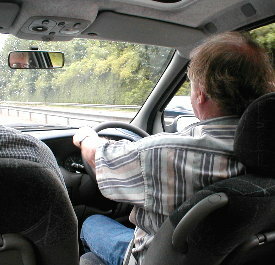 Here an unidentified senior citizen learns to drive on the left (wrong) side of the road. No tickets, No crashes, only a few horn blasts. Thanks to three dedicated and opinionated backseat drivers. 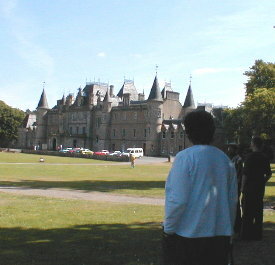 Esther's first glimpse of Callendar House. 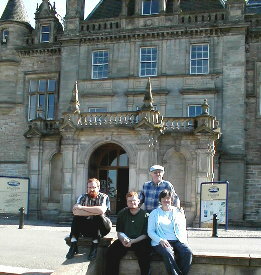 Being informed there was no back rent available, we settled for a family portrait by the front door. 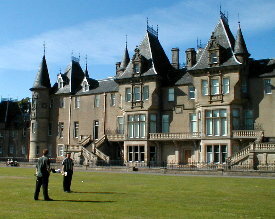 The backside of the House looks over a large yard and park area. Had the ancestors been more politically adroit, these fine lads might have learned soccer and cricket on this fine lawn, then again, maybe not. 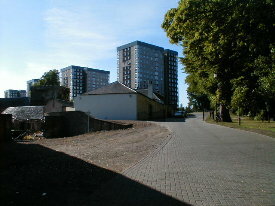 Falkirk, while not particularly noted for its clockmaking industry, historically was the industrial center of the area. 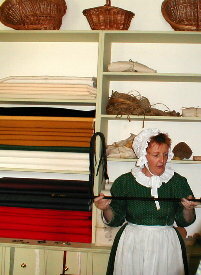 Another room in the Callendar House displayed typical dry goods and other items that could be found in a general store. 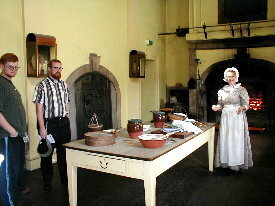 The 1820's style Georgian kitchen is a working kitchen creating meals and pastries every day. 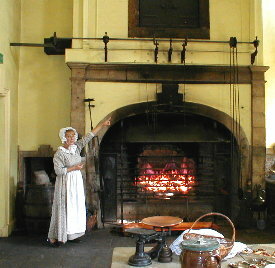 This young lady stokes the coal fired hearth, bakes the pastries and roasts the meats, using authentic utensils and equipment. 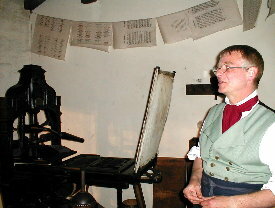 The printer, shown beside his working printing press, produces handbills, broadsides, and business cards. 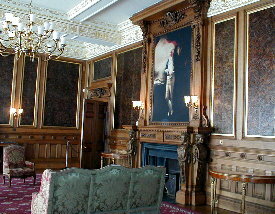 The elegant Morning Room has been restored to its original extravagant splendor. 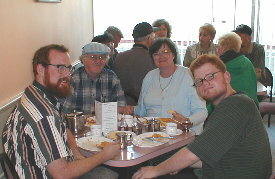 Supper at Ilario's in Kincardine provided the best fish and chips of the trip and a fair amount of loud fun and laughter from the Americans seated behind us, who were attending the British Open. 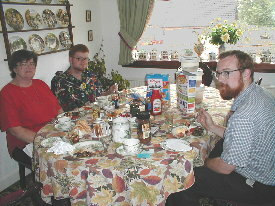 A hearty Scottish breakfast prepared by our hostess at the Four Winds B&B got us off to a good start on our excursion into the Trossachs, otherwise known as the Scottish Highlands. 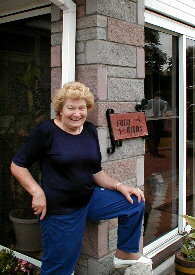 Mrs. Corbett rules the Four Winds with humor and good will. 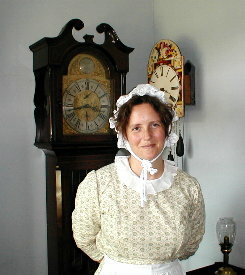 This lady has traveled the four winds and has many tales and trinkets. 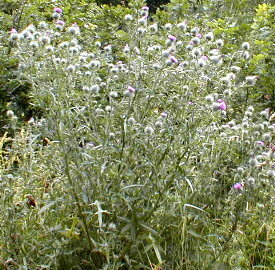 The Scottish Thistle is the proud symbol of Scotland. This should not be confused with the hated Russian Thistle of the Great Plains! 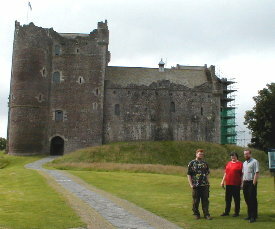 Here we see Doune Castle at the foot of the highlands. We learned that any place name having "doune", "doan" or "dun" is the site of a Roman fortification. Note the scaffold; restoration is an unending activity throughout Great Britain. They seem to live quite a bit in the past. Maybe that is because they have more of it than we do. Erin is known to many of his friends as "Squirrel". Someday he will be Dr. Squirrel. 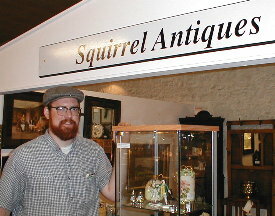 None of us knew he had a quaint antique shoppe in Scotland. 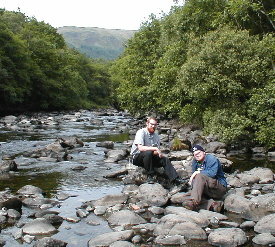 The river Teith is clear, cold and lovely. The lads decided to catch a few rays. 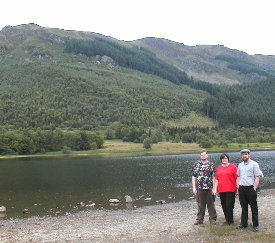 Loch Lubnaig a picturesque lake marked the northernmost extent of our invasion of the British Isles. From here on, we were on the way home. 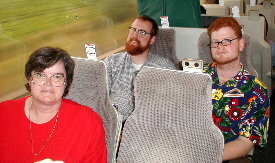 The train trip from Edinburgh to London seemed shorter than the other way. 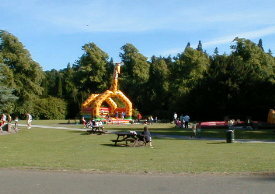 It was surely not as crowded and the weather remained fair and fine. 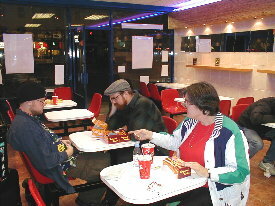 A quick bite at an incredibly tacky establishment in London was an attempt to prepare us for re-experiencing what passes for culture in Newark. The gentleman in the background slept through it all. Well it was a wonderful adventure. If you haven't gone we hope this encourages you to make the effort. If you are going, tips from Hal Shimmin are worth listening to. Prices are a bit of a shocker, but a little shopping on the Internet and taking some care pays off. Lots of merchants charge a fee for use of American credit cards, but Mrs. Corbett told us just to send her some money when we got home. We hope you enjoyed our trip. Thanks for stopping by.